When an ex-rower for some fancy Thames rowing club came to stay, it seemed the ideal time to discover the Sorgue, by kayak. I duly appointed him as my ‘stroke’ (his sporting wife gamely teamed up with Husband), while children were put mid-ship for improved instability. 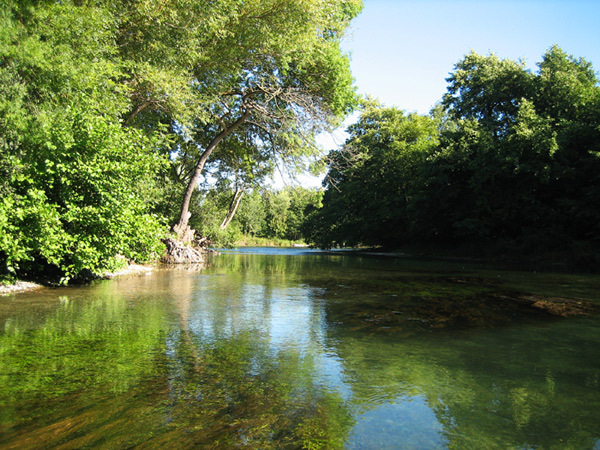 The magical green waters of the Sorgue flowed before us, and we were off, off on our own Swallows and Amazons adventure. This river is pristine and every bend offers up an ideal swimming spot. Ideal if you have the constitution of a penguin, for these waters are a heart-stopping 14 degrees year round. In a dreadful display of machismo, Husband and above rowing friend did indeed plunge several metres into the Sorgue from an overhanging branch to emerge breathing heavily, but alive. I prefer to wade in waist-deep, offering up my thighs to what feels like the equivalent of three weeks in one of those frozen seaweed cellulite wraps at the spa.